I have a thing for old farm buildings, if I think about why I like them so much I might have to say it’s because of their usual isolation and the toll the elements take on them. These buildings that served a purpose and were crafted by strong hands generations ago, and now stand alone in a remote place, beaten by the environment. Great shot. The windmill really adds a lot to the photo also. 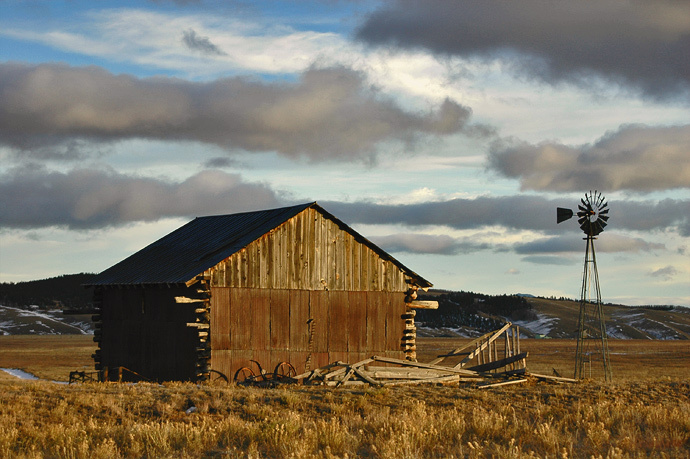 Beautiful shot, I also like old farm buildings like this. I could shoot images of old barns all day…if I could find any. With Arkansas being such a warm State, not too many were built except in the northern part of the State and many are too neglected. I have a few barn pics to post in the future. This is an extraordinary image. Looks like a pic out of the past.